We were delighted to launch our new young people’s challenge with Barry Hearn at Mary Green Manor in Brentwood. This initiative builds on our initial joint project with Barry called MATCH where teams of younger pupils raised money for the Hospice with a business plan reviewed and mentored by Barry. The new scheme KICK-START is for 16-18 yr olds. The scheme also brings in a wider group of mentors from local businesses and communities who will be supporting the teams. Look out for more information as we get teams of young people involved and they begin their fundraising challenges. As previously the winning team will be match funded by Barclays bank. 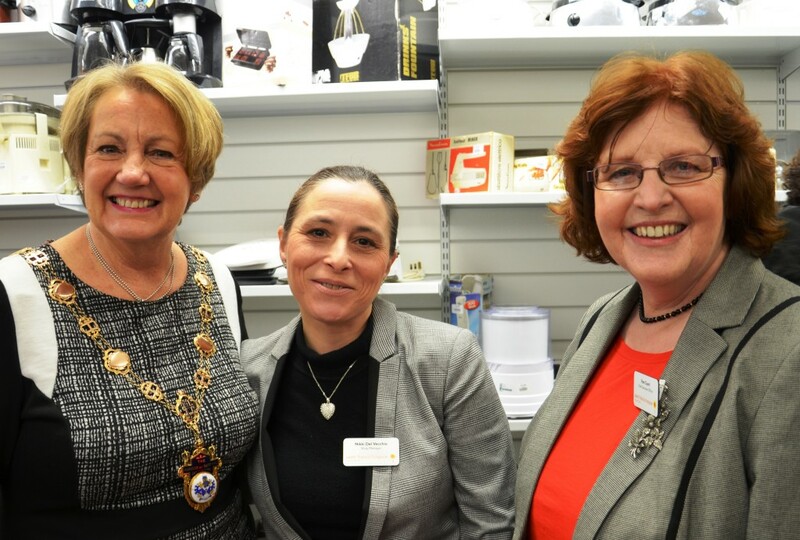 We had the opening of our new electrical shop ( moved from Avon Road) on 23 rd January. The Mayor of Havering ‘cut the ribbon’ to a queue of customers. We look forward to the success of this shop and thank you to all our supporters who give unwanted items so generously and to our customers for buying the goods, all of which have been ‘P.A.T.’ tested so are safe and in good working order. I enjoyed a lovely lunch with our neighbour at the Hospice Imogen Heap (Grammy award winner) and her new baby to discuss possible joint initiatives to build on our community in Havering-atte-Bower and supporting the Hospice. Imogen is an active supporter of the Hospice and we are delighted to continue to work together. Apologies for no BLOG. I’ve been off having ankle reconstruction surgery ( ankle surgery not for the faint hearted!). I’m still limited in walking and driving and wearing a boot ( no fashion statement) but back to work and a big thank you to the Director team who have ably ‘ held the fort’ while I have been away. So a belated Happy New Year to everyone. I was delighted to attended the launch of Imogen Heaps new highly aclaimed album SPARKS. 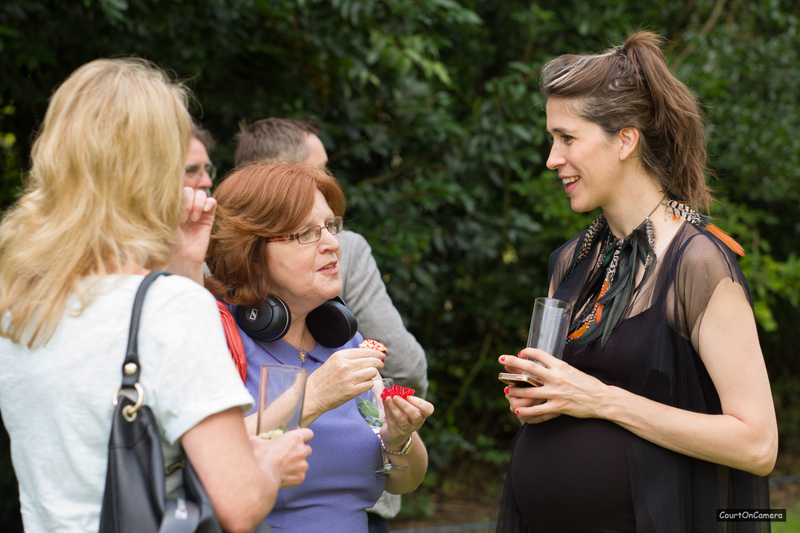 Imogen sang for us at our open gardens this year and we hope to continue to work with her in the future. Graham the Hospice Chaplin and I met with Mohamed Omer to visit the beautiful Garden of Peace Muslim Cemetery in Redbridge . The visit was so informative and the Peace and tranquility was extraordinary. Mr Omer is very supportive of Hospice care and has offered to do any training we require to support those of the Muslim faith using the Hospice and us meeting their needs. It’s our 30th birthday year and a huge thank you to the Local press who have given us such good coverage in the newspapers for our special birthday. 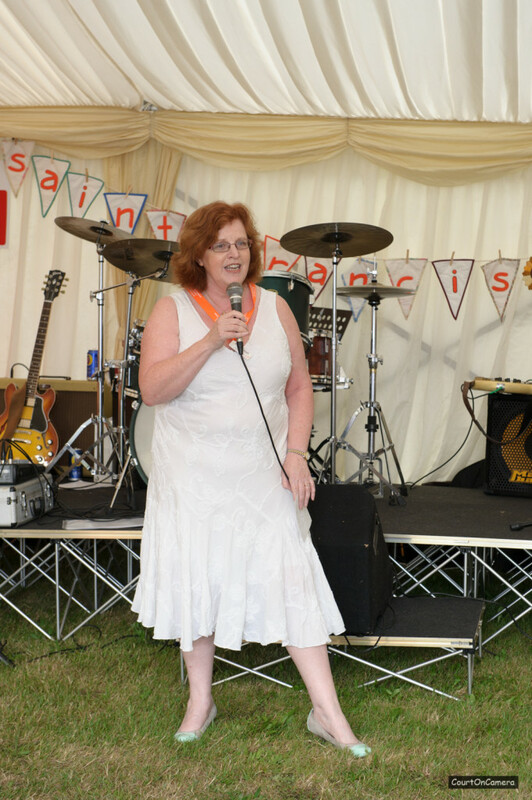 The date of our birthday was 23rd July, and during this week we had 2 very special events:- PARTY – firstly we hired a marquee on the village green for a party for our staff and volunteers. The event was attended by over 350 people and we had our long service awards, with a special mention to Gill Wendelken and Barbara Allen, both who have achieved 30 years service – what an incredible achievement and contribution to the Hospice. We had hog roast, puds, drinks and music and dancing. It was a great event, and all funded from people who wanted to give to the staff and volunteers. The event also couldn’t have happened without the hard work of so many. 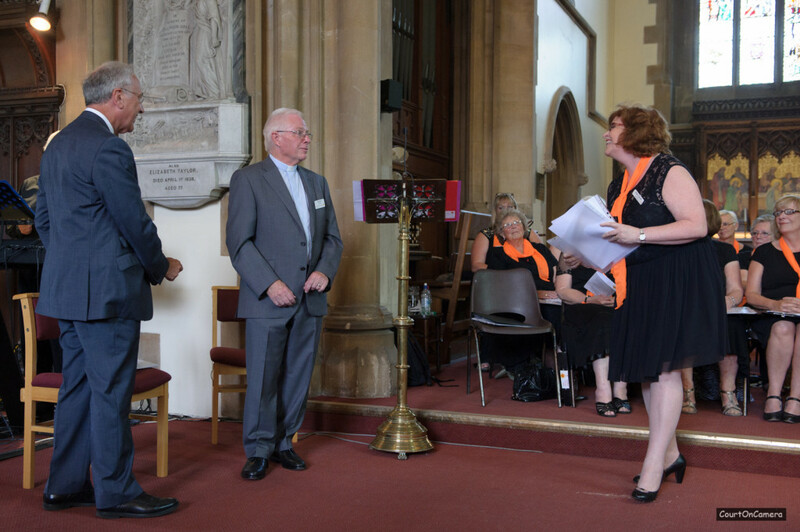 Birthday service – we held our 30th Birthday service at St John’s church on the green. It was a wonderful service with contributions from the Hospice Choir, Emily an amazing local singer, staff doing readings and Dr Dorothy Evans ( was Rule) who was a local GP and one of the founders working closely with Joan Mathews spoke with passion about her work in setting up the Hospice and the work it does. Thank you Graham ( our Chaplain) for the service and Anne Brown for organising everything including the cream teas afterwards. Graham received ( much to his embarrassment) his own 20 year long service award. Leaving in Epping where the Tour de France came through I had to be there for this historic event. It was very quick, but worth it! We had our second final of or schools MATCH challenge at Leyton Orient Football club, hosted and supported by Barry Hearn and match funded by Barclays bank. The teams had worked so hard with innovative fundraising ideas from car washing to cup cake making, and by a very small margin the winning team was TEAM APOLLO from Emerson Park Academy. A very big well done and congratulations to all entrants. The winning team APOLLO won iPads from Barry and the chance to spend some apprentice time at Matchroom Sport with Barry, and at the Hospice.